February 17, 2009: We are pleased to announce that we're releasing the latest enhanced version of our popular antispyware tool, Spyware Terminator. Read the whole article to learn more about the improvements included in Spyware Terminator 2.5.5. What's new in Spyware Terminator 2.5.5? 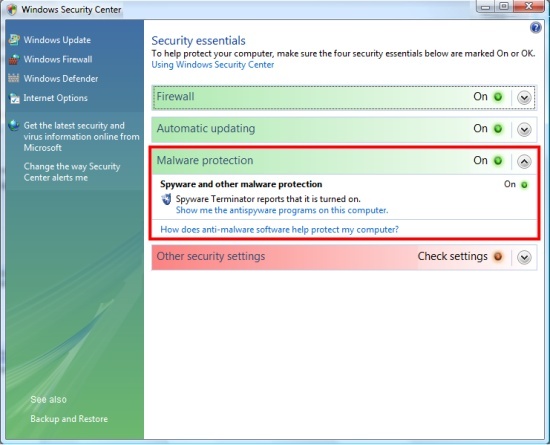 Integration of Spyware Terminator into Windows Vista Security Center - Spyware Terminator is now recognized as malware protection by Windows Vista. New version of ClamAV - Spyware Terminator now offers integration of the latest version of Clam Antivirus 0.94.2. Default protection level change - The default protection level of Spyware Terminator has been changed from Basic to Advanced. Other minor bugs fixes - We would like to thank all our users who reported unusual behavior that they experienced when using Spyware Terminator. Most of the reported bugs have been fixed. If you find any bug when using the new version of Spyware Terminator 2.5.5, please share it with us on Spyware Terminator forum.